The Clothesline Paradox and the Hidden Economies of the Web by Nick Grossman, founder of the Connected Innovation Network and visiting scholar at the MIT Center for Civic Media (September 6, 2012). Grossman writes about Tim O'Reilly's "clothesline paradox" and how we need to shift our thinking about measurement in order to quantify the web economy. Modeling the Costs of Cloud vs. On-Premise Computing by Andrew McAfee, principal research scientist at the Center for Digital Business at the MIT Sloan School of Management (October 24, 2012). McAfee discusses a model that shows how cloud computing can cut costs for small- and medium-sized businesses. Teacher Salary Project by Nineve Calegari, co-producer of American Teacher Project and co-founder of 826 Valencia and 826 National (March 9, 2012). Calegari explores the crisis of the American teacher and calls for policy change to support teachers. Internet Outlook: Good by Derek Slater and Betsy Masiello, Policy Managers at Google (October 4, 2012). 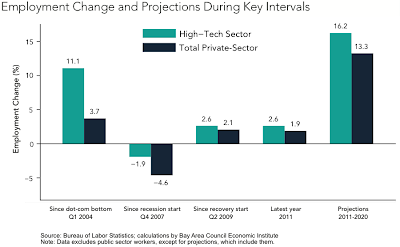 Slater and Masiello highlight a chapter in the OECD's 2012 Internet Economy Outlook report on measuring the Internet economy. Mapping the Ecology of Open Data Development by Viktor Mayer-Schönberger, Professor of Internet Governance and Regulation at the Oxford Internet Institute/Oxford University (October 25, 2012). Mayer-Schönberger discusses a report co-authored with Zarino Zappia on the ecosystem of open data app developers. College sports should hook ‘em online by Patrick Ryan, Policy Counsel at Google (September 8, 2012). Ryan argues that colleges should use the web to broadcast sporting events to as wide an audience as possible. Data Hangout on Air #4: Statistical Education (November 28, 2012). We hung out with professors Rob Gould (UCLA) and Chris Franklin (University of Georgia), who teach statistics to both college students and teachers, to talk to about the future of the discipline. Modeling a Market for White Space by Kate Harrison, a graduate student, and Anant Sahai, an Associate Professor at UC Berkeley (November 29, 2012). Harrison and Sahai discuss their proof-of-concept market for television white space. Wishing a very Happy New Year to all! With everyone doing their 2012 Best-ofs and highlights, we thought we'd hop on that bandwagon and repost the most popular Policy By the Numbers posts of 2012.
International Broadband Pricing Study: Dataset for public use by Ken Carter, Policy Counsel at Google (August 22, 2012). This post links to three Fusion Tables containing datasets of international broadband data. More data about copyright removals in Transparency Report by Fred von Lohmann, Legal Director at Google (December 11, 2012). We announced an update to Google's Transparency Report that enabled downloading the data on copyright removal requests for Google Search. World Aid Data Visualization: Competition Winner! Google co-sponsored with The Guardian's Datastore challenging entrants to create compelling visualizations using world aid data. Today we announced the winner in the The Guardian: Aidan Berensten's visualization of global aid spending by agency. Berensten used data from the International Aid Transparency Initiative to create a an interactive visualization so robust that it comes with its own tutorial. Check it out Berensten's winning work at iatid.com, and read more over at The Guardian, "See how the world's development aid flows with our competition winner." Back in October, we posted about a competition Google co-sponsored with The Guardian's Datastore challenging entrants to create compelling visualizations using world aid data. Today we announced the winner in the The Guardian: Aidan Berensten's visualization of global aid spending by agency. Berensten used data from the International Aid Transparency Initiative to create a an interactive visualization so robust that it comes with its own tutorial. Urban traffic and the difficulties of commuting are challenging issues for cities globally, especially as the already rapid pace of urbanization continues to accelerate. Delays in the U.S. alone cost an average of 34 hours a year per commuter. Moreover, wasted fuel, carbon emissions and opportunity costs mean that in the U.S. traffic congestion costs over $100 billion annually. Globally, these costs multiply: workers and students from Stockholm to Seoul cite daily commutes as a key cause of stress and missed time at work. Governments and private companies are investigating how to address the challenges of urban mobility, emphasizing improvements in infrastructure. But one year ago, the New Cities Foundation set out to understand the potential of making commuters part of the solution. In partnership with Ericsson and the University of Berkeley, the Foundation set up a Task Force on Connected Commuting to study the impact of connecting travelers who take the same daily commute route via smartphone apps that allow them to share relevant, useful information with each other. Two pioneering commuting applications were used for the study: Waze (for car commuters) and Roadify (for public transport users). We piloted the study in San Jose, CA, which city ranks 22nd among large American cities in number of person-hours delayed (42 million annually), and 25th in congestion cost ($842 million). The Task Force wanted to know: can a new level of networking between commuters enhance the overall commuting experience? Is the connected commute "better" than the unconnected commute? From a city perspective, is it more resource efficient? The findings of this year-long study present an opportunity for transport agencies, local governments and app developers to identify alternative ways to effectively improve the commute experience. From a policy standpoint, the Task Force study's bottom line is this: while innovative long-term solutions such as road space rationing (Brazil), license plate quotas (China), and congestion pricing (Britain) should continue to be implemented, in the short-term, encouraging and utilizing crowd-sourced information sharing among commuters—especially if done in a safe manner—can be an efficient, cost-effective way to build a community of commuters who themselves provide solutions to the woes of commuting. The Task Force found that commuters' ability to receive or share real-time information with other travelers can effectively reduce commute-related stress and provide a sense of community. Car commuters who are connected to other commuters via social commuting apps tend to be happier with their commutes than unconnected car commuters because of the timely information they receive—allowing them to adjust their travel—and also because of the information they're able to share with others, giving them a sense of satisfaction at helping fellow commuters. Crowd-sourced data from commuter apps is highly relevant to the topic of commuting (unlike more general social networking platforms). For transport agencies and mobile app developers this means that real-time commuter information-sharing can be a useful tool for geolocalizing frustration, that is, pinpointing where commuters are experiencing problems and at what time of day. This can, in turn, provide feedback on routes that need to be better managed by authorities. Similarly, areas associated with positive commuter sentiment could provide app developers with real-time data that acts as the basis for recommended travel routes. Naureen Kabir is Director of the New Cities Foundation Urban Lab. Francisco Ruiz Anton is a Policy Manager for Google in Spain. to talk about the big stories and trends in data from 2012 and get his outlook for 2013. Alex touches on some important policy issues relating to data, including privacy and security, identity, and ownership. Today we hung out with Alex Howard to talk about the big stories and trends in data from 2012 and get his outlook for 2013. Alex touches on some important policy issues relating to data, including privacy and security, identity, and ownership. Boston Consulting Group says that the UK is the largest nation in the G20 as a percentage of GDP—8.3% compared to an average of 4.1%. The UK is a nation of e-shoppers, with almost two-thirds of consumers reporting having purchased goods or services online in the previous three months. That’s almost twice the average for the countries in the Eurozone. The UK was also the first country in the world where online advertising spend overtook TV advertising in 2009. Yet, a recent study of digital readiness from Booz & Co. puts the UK in an unimpressive twelfth place and ranks the nation eighteenth on average broadband connection speeds. They find that two-thirds of UK SMEs have "little or no presence online." Only 14% of UK SMEs sell online compared 30% in Norway. Eurostat data confirm that UK businesses are not among the leading pack of countries in e-commerce markets. Our new research on how UK businesses collate and use their online customer data adds to this picture of lagging engagement with digital. Our findings suggest that collection of data is patchy, and that four out of five businesses with active online operations are not making full use of their data for decision making. Even in our Internet-active sample, only 38% of businesses collect comprehensive transactions data. In the majority of businesses, the analysis of online data is only basic and descriptive. For example, only 27% run A/B experiments and other controlled trials and an even lower 13% use statistical techniques such as regression analysis. Only 41% of businesses in our sample use online data to inform their business strategy, and fewer use it to optimise prices. Even among the sub-sample of firms for whom e-commerce makes up more than half of overall revenues, less than four in ten use their online customer data to set prices. However, 18% of businesses in our sample—the 'datavores'—are showing the way. They are likely to collect, analyse, and, above all, act on their online customer data. They appear to be investing more aggressively in data capabilities than other firms, suggesting that companies who don’t learn to use data will be left even further behind. Datavores are four times more likely than intuition-driven companies to report a positive contribution from their online data and are even more likely to be product innovators. The implication here is that that there may be an immediate benefit to the UK economy if more businesses made use of online data. What might all this mean for policy? Policymakers need to think about how to create a regulatory environment that strikes the right balance for consumers between data privacy and the potential benefits to be gleaned from data use, like more efficient pricing of products and rapid product innovation. Concerns about data privacy and security ranked highly as a barrier to greater use of online data by the datavores in our survey. Policymakers should also heed the importance of sound analytical and management skills if the wish to encourage data-driven business. They should ask whether the education system attaches enough importance to such skills, and whether the system is prepared to cope with increasing demands as more businesses begin to unlock the value of data. Hasan Bakhshi is Director, Creative Economy and Juan Mateos-Garcia is Research Fellow in Nesta’s Policy & Research Unit. We believe that data should play an important role in figuring out how to make copyright work better online. Six months ago, we launched a feature in our Transparency Report that discloses how many copyright removal requests we receive to remove Google Search results to help inform ongoing policy conversations. Starting today, anyone interested in studying the data can download all the data shown for copyright removals in the Transparency Report. The data will be updated every day. We are also providing information about how often we remove search results that link to allegedly infringing material. Specifically, we are disclosing how many URLs we removed for each request and specified website, the overall removal rate for each request and the specific URLs we did not act on. Between December 2011 and November 2012, we removed 97.5% of all URLs specified in copyright removal requests. As policymakers evaluate how effective copyright laws are, they need to consider the collateral impact copyright regulation has on the flow of information online. When we launched the copyright removals feature, we received more than 250,000 requests per week. That number has increased tenfold in just six months to more than 2.5 million requests per week today. While we’re now receiving and processing more requests more quickly than ever (on average, within approximately six hours), we still do our best to catch errors or abuse so we don’t mistakenly disable access to non-infringing material. We’ll continue to fine tune our removals process to fight online piracy while providing information that gives everyone a better picture of how it works. By making our copyright data available in detail, we hope policymakers will be able to see whether or not laws are serving their intended purpose and being enforced in the public interest. Fred Von Lohmann is Legal Director at Google. 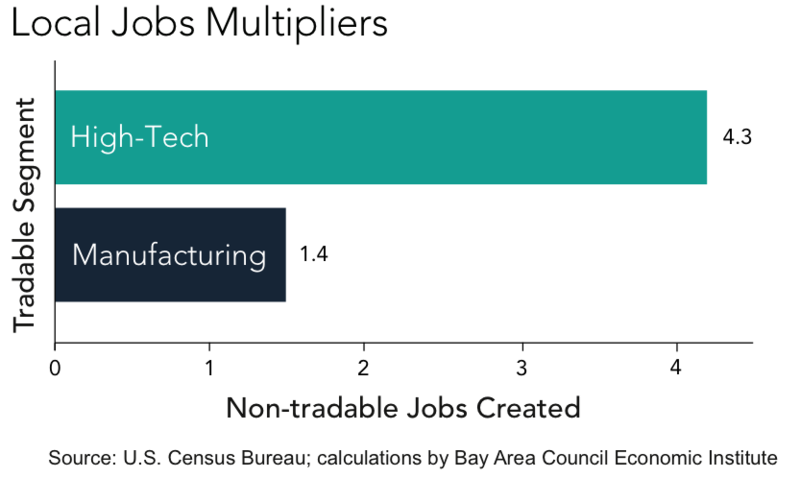 Yesterday my colleagues and I at the Bay Area Council Economic Institute published a report detailing the importance of high-tech employment to the U.S. economy. It is the first of two studies aimed at providing a better understanding of job creation and business formation in America today—in particular the role that high-tech plays in the process. Part two will focus on the job creation dynamics of high-tech startups and will be released in a few months. Both reports are made possible by a generous contribution from our friends at Engine Advocacy. Below is the executive summary of the report as well as some key graphics. We hope you’ll find it as interesting as we do. Enjoy. Ian Hathaway is a Research Manager at the Bay Area Council Economic Institute in San Francisco. is a Professor of Information Ethics in the Graduate School of Business Administration and Deputy Director of the Centre for Business Information Ethics at Meiji University in Tokyo. This is the first of two Policy By the Numbers posts by Andrew on open access publishing. Scholarly academic communications began with letters between early scientists. Groundbreaking work was sent to multiple people and as the early scientific and scholarly societies grew they started distributing their proceedings to their members, and making them available in libraries. As academia expanded and in particular as science and engineering grew to industrial scale enterprises in which the unknowing duplication of experiments was seen to be a waste of money (knowing duplication as an independent check on results remains a valid exercise though unfortunately one which is rarely given the importance it deserves) the need for wide dissemination of experimental results led to the emergence of scientific publishers of three types: scholarly/scientific societies with a specific disciplinary focus; university presses with a mission partly driven by dissemination of their own researchers' work and partly by general academic desire to improve communications; commercial publishers either founded specifically to meet an apparently unmet need in a specific area or general publishers using their expertise and economies of scale in typesetting, printing, binding and distribution to provide a valuable service to academia as a conduit for scientists to talk to each other. The "gold standard" of academic publishing gradually emerged as peer review: consideration of the merits of a piece by other scholars/scientists with appropriate knowledge of the relevant field. Over the course of the twentieth century a large publishing industry emerged with a set of common practices followed by most publications and most publishers. (There are exception to these practices but there is no space to present them here.) Academics (and a small proportion of researchers in independent research institutions and commercial labs) constitute the main authors, reviewers, academic editors and academic editorial boards of the journals (and in Computer Science fully reviewed conference proceedings) in which most academic work is published. In the twentieth century, publishers provided typesetting, copyediting, printing and distribution services. They generally made a reasonable profit margin on these activities, whatever type of publisher they were. In return, authors (mostly academics) transferred the copyright in their work to the publishers, without charging any financial recompense. Likewise reviewers and editorial boards are generally unpaid. Editors may receive a small stipend and/or a small contribution to administrative support costs (though by no means always). Since about 1990, the system has come under multiple pressures. Commercial publishers have merged or been taken over and a small number of large players, sometimes part of larger multimedia conglomerates and sometimes just large primarily academic presses (though usually also publishing at least textbooks and monographs as well, and often publishing other education/research-related materials). Scholarly societies and universities have come to expect profits from their publishing arms which will support their other activities. Commercial publishers have consistently increased their subscription prices well above both inflation and the funding available to most universities) while at the same time their costs should have been going down after an initial investment in digital reproduction technologies was covered. Meanwhile in a few fields such as Computer Science and Physics (most notably High Energy Physics) the new technology of the Internet was providing a parallel route for academics to disseminate their peer-reviewed articles, first using ftp sites, then the Web and finally through databases with web interfaces providing both machine- and human-accessible meta-data as well as the postscript, pdf, Word document, HTML etc format versions of the text. In addition to this, a relatively small number of journals have been either founded with no subscription costs for electronic access, or moved to such a model. The funding to support these journals comes from a variety of sources including fees from authors who publish (occasionally fees from authors who submit for possible publication), academic society, university, research funder, government or charitable donation support and others. While there remain some methodological difficulties and disputes, most of the studies carried out in the last ten years have shown that when articles are available without readers being restricted by payment (either institutional or individual subscription to the journal or by payment for the individual article) then that article is cited more often. Since the primary purpose of research writing is communication with other researchers and impact on the field, one crude measure of which is the number of times an article is cited, then it is clearly in the interests of research authors, their institutions and the funders of their research that their articles are made freely available. This is, in effect, a pre-requisite for a free market in scholarly/scientific ideas in which the best ideas rather than those easier to access, receive greatest attention. Andrew Adams is a Professor of Information Ethics in the Graduate School of Business Administration and Deputy Director of the Centre for Business Information Ethics at Meiji University in Tokyo. This is the first of two Policy By the Numbers posts by Andrew on open access publishing.